A city that has so much to offer, with world-famous sites such as the Sydney Opera House, Sydney Harbour Bridge, Sydney Tower, The Darling Harbour, to name just a few, what tourist attraction is your favourite and why? Perhaps your favourite attraction is actually a thrill or an adventure ride. Share yours with us. I haven't been in a while, but Taronga Zoo is pretty good. There's all the animals, and the views of the harbour, and it's one that people from both Sydney and the rest of the world can enjoy. The only problem with it is that it's not free, unlike some other iconic sites. I actually quite enjoyed a trip to the top of Sydney Tower and the 360degree views were stunning, especially in the evening. Putting yourself back into the shoes of a tourist is not easy. My votes would go to the Sydney Opera House, and then to the Sydney Harbour Bridge. Darling Harbour is also a tourists mecca, no different to Melbourne's Southbank. Agree with joya - Opera House and perhaps Harbor bridge. Oh, and anywhere that can catch a glimpse of kangaroo and koalas. I agree with Vanessa, Taronga Zoo has always been my favourite attraction. 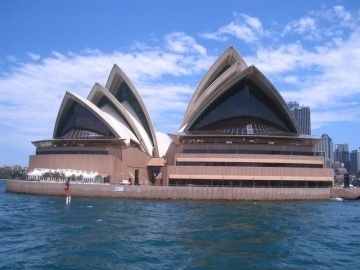 The Wildlife World and Sydney Aquarium are also quite enjoyable and the Madame Tussauds exhibit is now there also. 'The Coathanger', Manly Ferry, Taronga Park Zoo, & Luna Park.......have always been top of my list, since a child! What is the most unique building in terms of architecture in Sydney? Been to the Moomba Festival in Melbourne? Does Melbourne need an airport in the South Eastern suburbs?